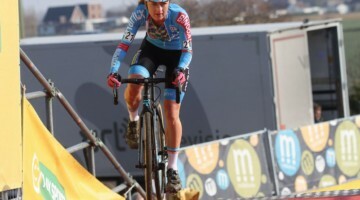 Loes Sels (Pauwels Sauzen – Vastgoedservice) won her penultimate race before the 2019 UCI Cyclocross World Championships in Bogense, Denmark. 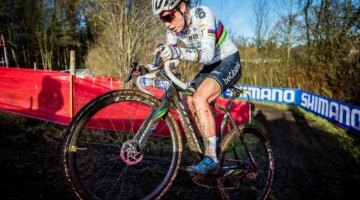 On the day before the final World Cup stop in Hoogerheide, Sels took a muddy victory ahead of California-based Czech Katerina Nash (Clif Bar). Sels is one of just four Belgians heading to the Worlds next weekend. 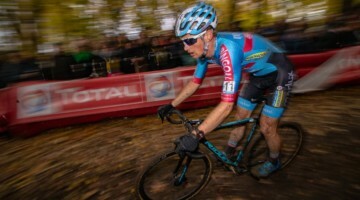 Nash and Sels weren’t the only ones tuning up for Hoogerheide and Worlds. Four Americans took the start, with two recently-announced Worlds team members. Rebecca Fahringer (Kona Maxxis Shimano) took sixth, Elle Anderson (Milwaukee – Alpha Motorhomes) finished in seventh, Emily Werner (Amy D. Foundation) in lucky 13th, and Cyclocross Magazine contributor extraordinaire Corey Coogan Cisek (Amy D. Foundation) finishing in 16th.